You might have noticed the skin voting section in the sidebar. I think it's working well, but it hasn't been tested. Rules are pretty much the same as what they were a few major versions back: you get one vote, and it'll be returned to you after about three days. The skin with the most votes wins, but in the event of a tie it's random which you'll get. I'll see if I can't do a nice skin in the next few days. The registration system isn't broken anymore. I fixed the shoutbox too. I'll be surprised if The Arcade Fire's new album Neon Bible doesn't make waves. It's amazing. I'm living in an age that calls darkness light. Though my language is dead, still the shapes fill my head. I'm living in an age whose name I don't know. Big sounds. Orchestral. I don't know what else you might expect from a 7~9 member band. They're practically The Polyphonic Spree, but with better sensibilities. But also restrained. There's a sound of suppression and stifling to the whole thing. 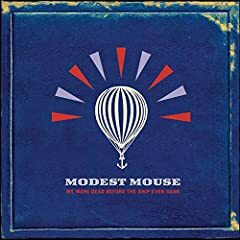 I'm also enjoying Modest Mouse's Dashboard, the only single released (so far) from their upcoming We Were Dead Before the Ship Even Sank. It's a frantic, silly, bouncing thing. Awesome. It actually touches some of the same area covered by Neon Bible: sweeping, broad, and dulled. Like a cello playing in the next room. There are a few things out of place on IE6. I don't want to think what it looks like in IE5 (I haven't checked). And some things don't look too nice when the right side is shorter than the left. All in all I'm happy with it though. If anyone out there is wondering, this skin is taking the piss out of "web 2.0" sites. It's kind of a web developer in-joke. Sorry if you don't get it. Just look at the pretty pink colour and laugh. Seeing as the new skin is up, I thought I'd do some web2.0 mashing of data. I took the top 50 albums from my Last.fm profile. Then I grabbed the MusicBrainz metadata for each, and pulled off the release date (if it had one). That left me with 34 albums, and weighted them toward newer and more popular albums (unfortunately). I scripted it all up quite nicely, so if you'd like me to run it across your profile, just drop me an email. Or, if there's enough demand, I'll release the (PHP) script over on DoubleMu. It should also, with a bit of tweaking, be possible to run this sort of analysis on the main Last.fm charts. I'd love to be able to do this with artists - I think it'd be quite a bit more accurate. But I don't know how to pin down a year for an artist. Should it be the year of their first release? The year they formed (not many (any?) artists have that data on MusicBrainz)? Half way from their first to their last release? Or perhaps a count for each year between their first and last? I noticed a few inconsistencies in yesterdays figures. Like, Rubber Soul and Pet Sounds (both 1966) showing up in the Quilt, but not on the graph. So, I set about trying to increase the number of albums on the chart. There are two problems causing that to be less than fifty: some of the albums don't have MusicBrainz IDs in the Last.fm feed, and some of the MusicBrainz releases don't have associated release events. So, I just did a manual search for album titles. Turns out, Google isn't the best place to get album release information. For instance, I bought this album in 2001, apparently four years before its release. Anyway, I've done charts for Justin and Alyx too, and put them on the same scale. Still missing 7~11 albums from each. I'll try to automate the process of finding release data, but I don't know where my other data feed will be. Perhaps freedb? But they've been really inaccurate each time I've used them (I can't even find Roll On from their search, let alone find the release date). It looks like, by anyone's estimation, 2004 was a good year for music. I just whipped up a dark skin. It should be available for voting now. If you're using IE6 or below, you might want to give this one a miss - it has a whole bunch of 24 bit PNG images. The opening concert of AK07 is on the 10th of March. 'Groupe F', a group of French pyrotechnic artists, will be doing a display at Auckland Domain (Un Peu Plus de Lumière). They're the group behind the displays at the Olympics, the Football world cup, and the New Year displays in London. Don McGlashan and the Seven Sisters will be playing before nightfall. It sounds like an awesome gig. I'm planning to go - anyone care to join me? Looks like the alcohol ban only extends to the end of Grafton Bridge, and I haven't been able to find anything about an event specific ban. I selfishly hope the event isn't well advertised. Also, in looking up information about the alcohol ban, I've found out that it's fine to drink alcohol in the street for Trav's party next weekend. But if it were held on a Wednesday, you wouldn't want to walk up the hill with your drink. The full album has been leaked, over a month before the official release. This happened for 2004's GNfPWLBN as well. The interesting thing is that, on that album, the leaked version was different from the release. Not in the mix, or the mastering, just in the actual vocals in places. I wonder if the same will happen here. Dashboard is sounding different to the New Year version (the horn part specifically), but I like the older version better. You can hear the new version on MM's website. My favourite part so far is in Fly Trapped in a Jar: "One wing wasn't even enough to leave." Doesn't even make a dent. 245 FPS is what it was doing before firing the larpas. About a ten fold improvement. Cool eh?! I've just managed to get the new scons build system working in Windows, which will mean I can develop without booting into Linux. And it also means I can release Windows snapshots of what I've done so far. Because I haven't touched Zoidcom yet, these versions are compatible for network play with Gusanos - so there's no reason not to upgrade. So, here's a download link. I've stripped out quite a few maps - feel free to move them in from your Gusanos directory if you'd like. Otherwise, happy fragging! Edit: I left a DLL out of the zip ('OpenAL32.dll'). The zip has since been updated, but you can get just the missing DLL if you'd rather not download the whole thing again. I'd love some testing, especially of the networking (I've only tested Vermes to Vermes network play).